Xerxes I (ca. 486-465 B.C.) 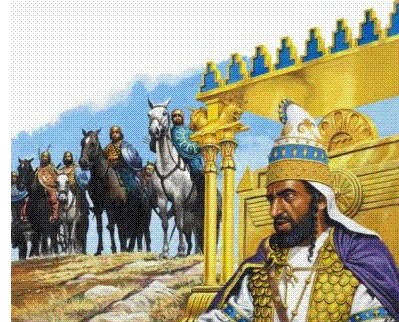 - Xerxes became King of Persia in 486 B.C., the intermediary period in the war with Greece. He inherited this war from his father, after the tiny city-state of Athens humiliated the mighty Persian army at Marathon in 490. Persia had some unfinished business and Xerxes intended to make all of Greece pay. But before he could, he had to quell revolts in Egypt and Babylon. Finally, by 483, he was ready to make preparations for a massive invasion of Greece. Virtually our entire source of this conflict comes from the Greek historian, Herodotus. Xerxes had learned lessons from his father and tried not to make the same mistakes. A military invasion required naval support, and Darius' navy suffered heavy losses sailing around the peninsula of Mt. Athos (Akté). So Xerxes dug a canal through the peninsula so he wouldn't have to sail around it. 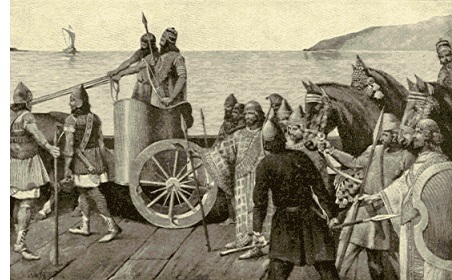 He also built a massive pontoon bridge across the Hellespont so his army could cross on foot rather than have to be ferried across. At the time, this was considered a monumental achievement. Herodotus says the army was so vast, it took seven full days for it to cross the Hellespont. He numbers the size of the army at about 2.5 million, a ridiculously high number. Modern experts believe that logistically Xerxes probably could have moved and supplied an army of no more than 200,000; still an overwhelming force for an invasion of Greece. The navy, despite the precautions taken, still suffered heavy losses in the dangerous Aegean waters. Such a large force would have been slow moving and this gave Greece time to prepare for the invasion. The first thing they had to do was put aside their longstanding differences and unite against a common threat. The various city-states agreed that, as the most powerful military state, Sparta should be in charge of the overall campaign, while Athens would head up the naval operations. They decided to make their stand at Thermopylae because of the narrowness of the pass. This is where the famous stand of the 300 Spartans occurred; however, there were about 7,000 hoplites who defended Greece at Thermopylae in 480 B.C.. Meanwhile, an equally dramatic battle was taking place off the coast in the Artemesium Straight between the two navies. After three days, the Greeks were finally overwhelmed, but not before Persia suffered heavy losses both on land and at sea. They continued on, into the heart of Greek territory, but must have done so tentatively after facing such fierce resistance. The Athenians had abandoned their city and sought refuge off the coast on the island of Salamis, surrounded by their navy. Xerxes, stinging from heavy losses at Thermopylae, burned Athens to the ground, and sailed his ships into the small straight near Salamis in hopes of striking a decisive blow against the Greeks. However, in the tight quarters, it more maneuverable Greek triremes that took the initiative. Because of their shear numbers, the Persians were disorganized and essentially became sitting ducks for the Greeks. They lost 300 ships and were forced to withdraw. Since Xerxes' army was supplied by his navy, he could no longer support his troops in Greece and was forced to retreat back to Asia. He left a contingent in Greece, under the command of his cousin, Mardonius, which was likewise defeated at Plataea the following year (479 B.C.). After that, Persia would never again threaten the Greek mainland (see the Persian Wars above for more information).